Having left Formel B after two-and-a-half years there, he busied himself with brief stints at the Hotel d’Angleterre, Plaza Sofitel, le Sommerlier (stage) and Restoration, reuniting with Paul Cunningham at the last. 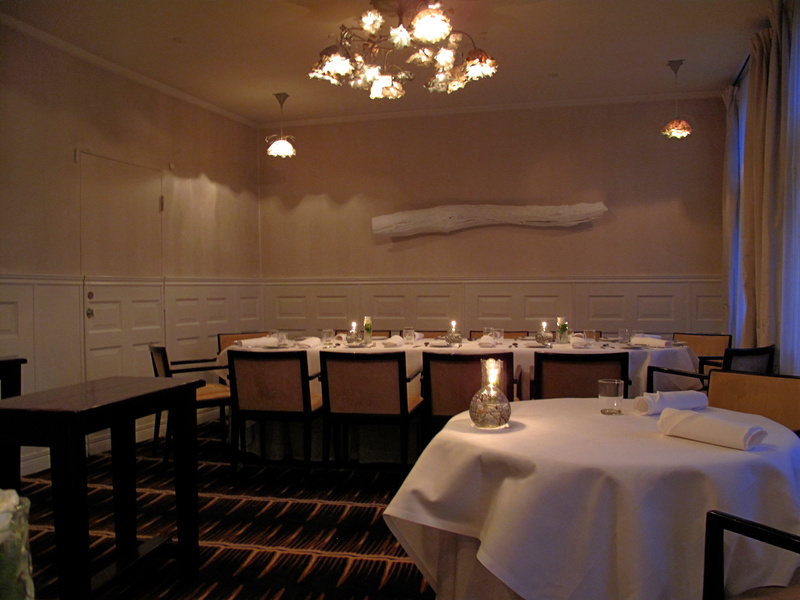 Both then moved to Coquus in 2002, but soon departed as Cunningham had plans for his own restaurant The Paul in Tivoli the next year; as they awaited its opening, Refslund completed a stage at Mitt. 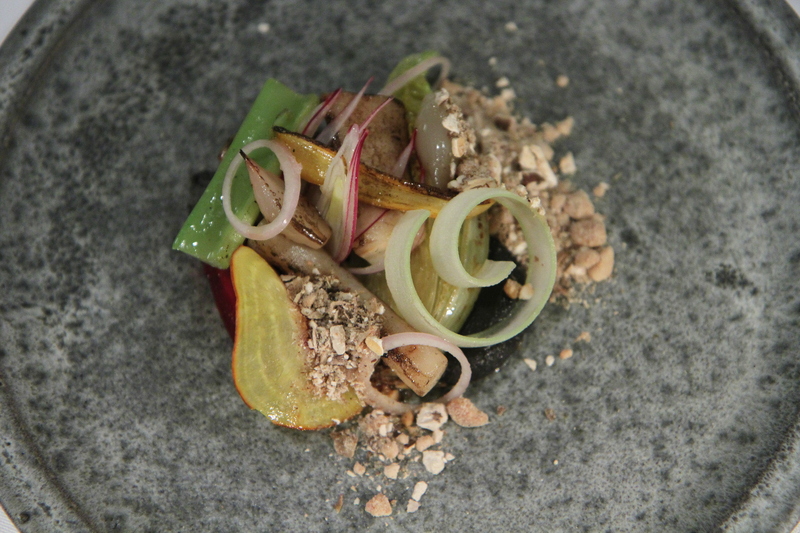 However, shortly after its launch, Redzepi and Claus Meyer approached him. They were just about to start their own project – noma – and offered him a partnership. He accepted. The trio embarked upon a three-month research tour of the Nordic region; it was an enlightening, life-changing experience. Upon their return though, the two friends soon discovered that they could not work well together. Refslund therefore left noma six months after joining, but he did so with no regrets and a friendship still strong. 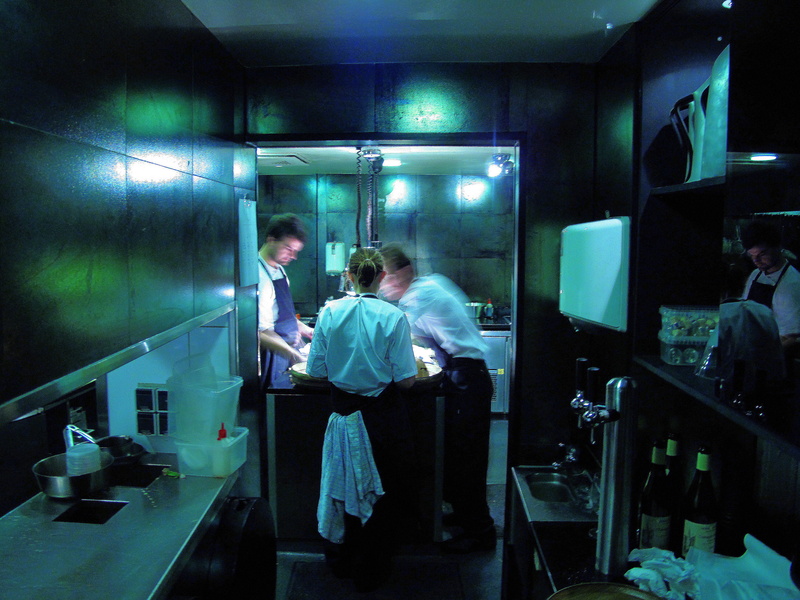 After a short spell in early 2004 under Mathias Dahlgren, then at Bon Lloc in Stockholm, the Dane took over the kitchen at Kokkeriet. A year on, he received a call from a would-be investor wanting to set up a new restaurant. Refslund felt that ‘he was looking for a little bit of a famous cook’, but having drifted around so much heretofore, he was looking to settle down himself. ‘Coming here, I said, ‘I want to build it my way.’ And so he did. MR opened in spring 2005 to immediate acclaim. Within one year, Michelin had awarded him an espoir; within two, Refslund had won his first star. 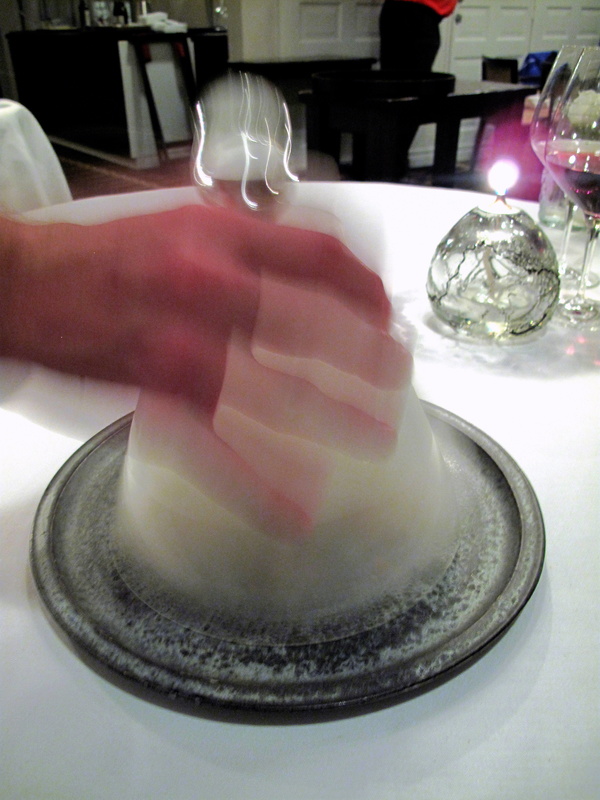 Domestic recognition was just as ready – no one in Denmark has received more annual prizes (Årets Gericke née Årets Ret) for their dishes (2007 dessert; 2008 starter; 2009 starter). Nevertheless, trouble was brewing behind the scenes. ‘I am MR and I will not let go,’ was Refslund’s instant reply. He reacted quickly and within only three months had found ‘three new investors with hearts in the right place’. He also negotiated with his former partner to keep the same name and contacted Michelin to inform them of the situation and assuage any anxieties they may have had. On 30 June, MR reopened. To achieve this, the chef has established relationships with Jutland fisherman able to provide him with diverse types of fresh fish whilst additionally securing a Greenlandic agreement supplying a huge range of raw shellfish. 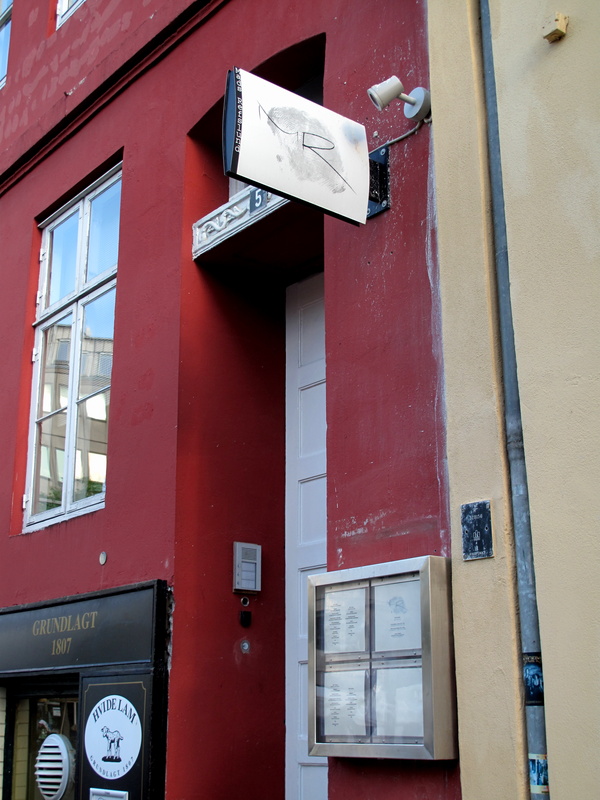 Refslund – a media darling anyway – has won over many critics since the transformation and MR is now only one of two Michelin-starred seafood restaurants in all of Scandinavia. Whither once the general public went to buy coal for their fuel, discerning society now seeks ‘fish that swims against the tide’. 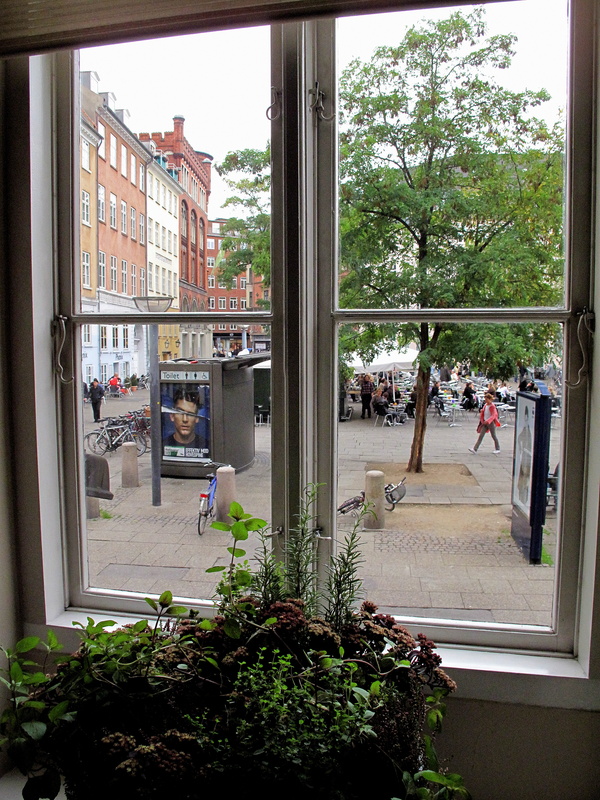 MR resides in a little red house on the southern side of Copenhagen’s arguably most central square, Kultorvet. 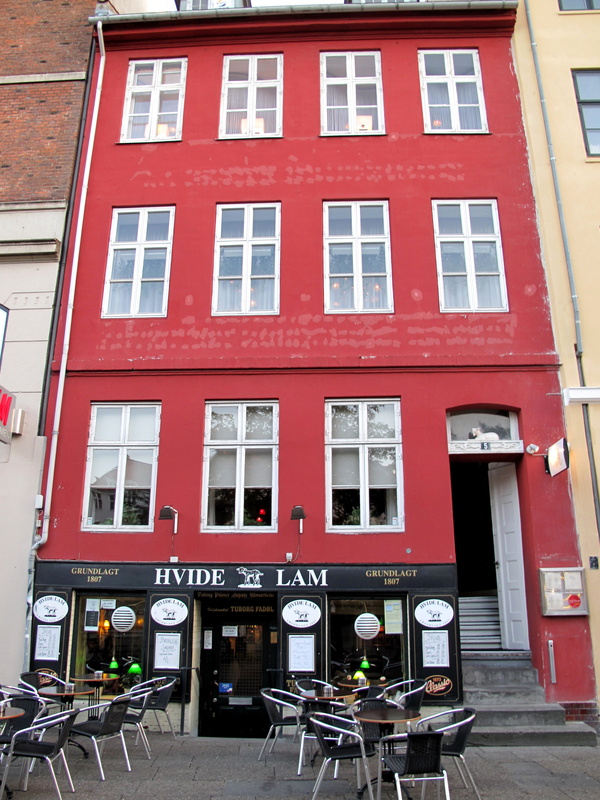 The restaurant occupies the top three levels of the building, but the ground floor holds one of the city’s oldest and most popular pubs, Tavern Hvide Lam, which dates from 1807. The raised entrance, marked by an ivory door and little else, leads onto a small corridor that links into a long reception room. Pristine white panelling; hansa yellow hued wallpaper embossed with what could be cream lines of fleurs-de-lis; flowing rich burgundy drapes that fall upon the hard, dark wood floor; a vintage iron stove and pipe; and sleek, blonde low seating give the impression of an old-fashioned, unpretentious and elegant clubroom. 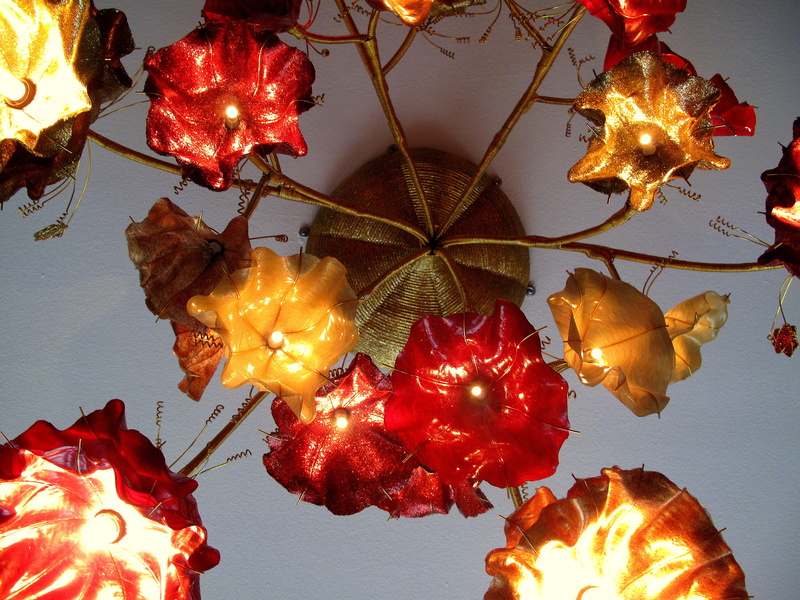 Multi-coloured candles, amber and crimson flower-bulb chandeliers and soft jazz are more bohemian touches. 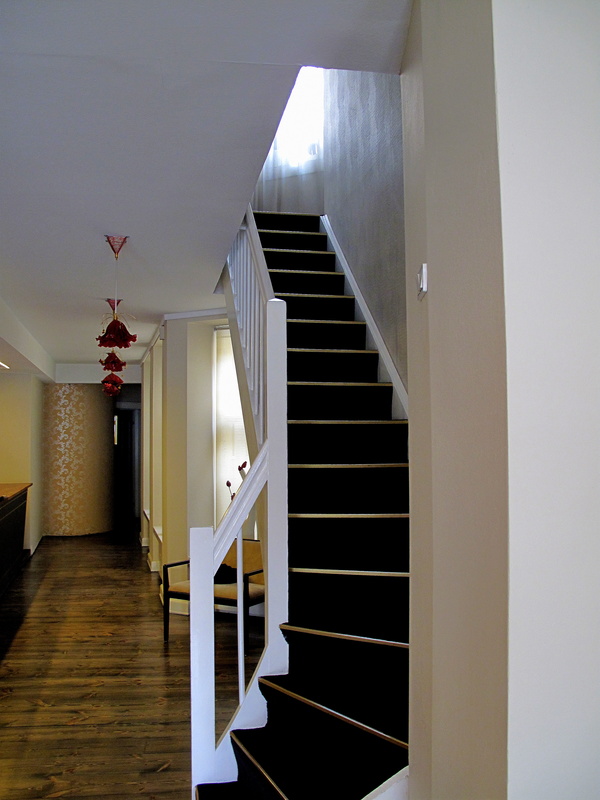 A staircase trails the inner wall and directs the diner to the main dining area on the first floor in front of the kitchen. Opposite the stairway a golden banquette borders the wall whilst an extended serving station stands alongside it. To the left, is the most spacious, more open half of the room holding the largest tables. The décor is minimal. Eggshell-shaded walls are skirted by big alabaster boards; tables are thickly laid with immaculate white linen; and the only adornment about the room is a bulky section of blanched tree bark upon one side as well as more amber flower-bulb lighting. The black and pearl carpet bears a pattern best described as resembling a backgammon board. The contrast between the quaint interior and Refslund’s contemporary cooking is a subtle and clever one; ‘a meeting of history and modernity’ is how he himself terms it. 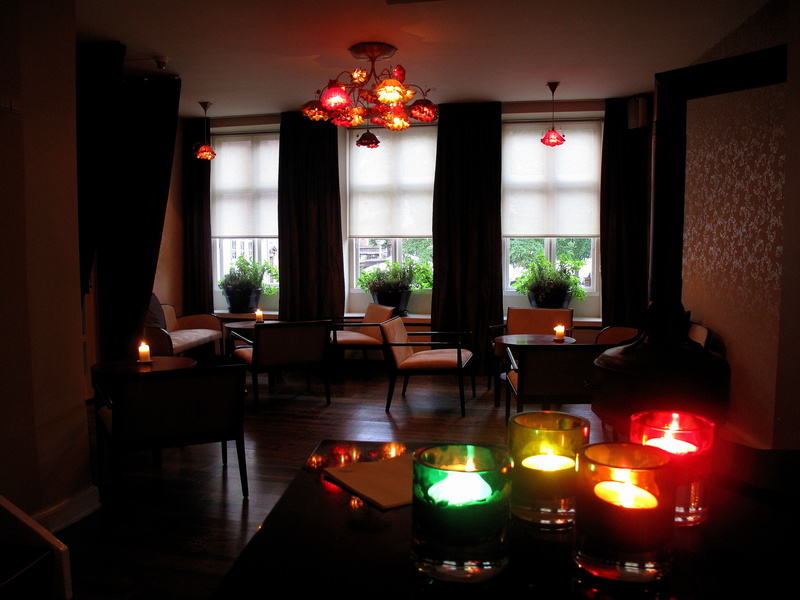 Additionally, there is an enchanting and comfortable air to the entire restaurant, which for many locals evokes the feel of a Danish fairy-tale. 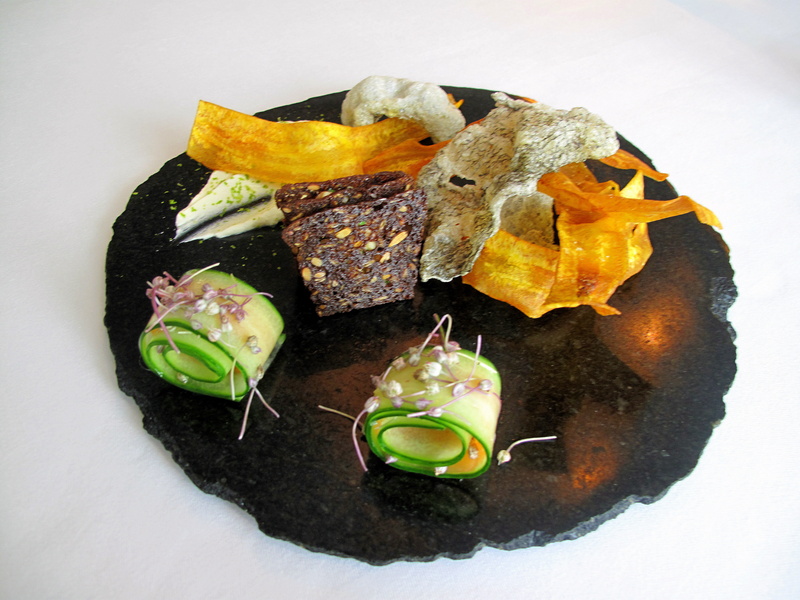 Amuse Bouche 1: Agurk og laks; Rugbrød, røget ål og æble; Stegt banan med karry; og Sprøde fiskeskind med eddike. 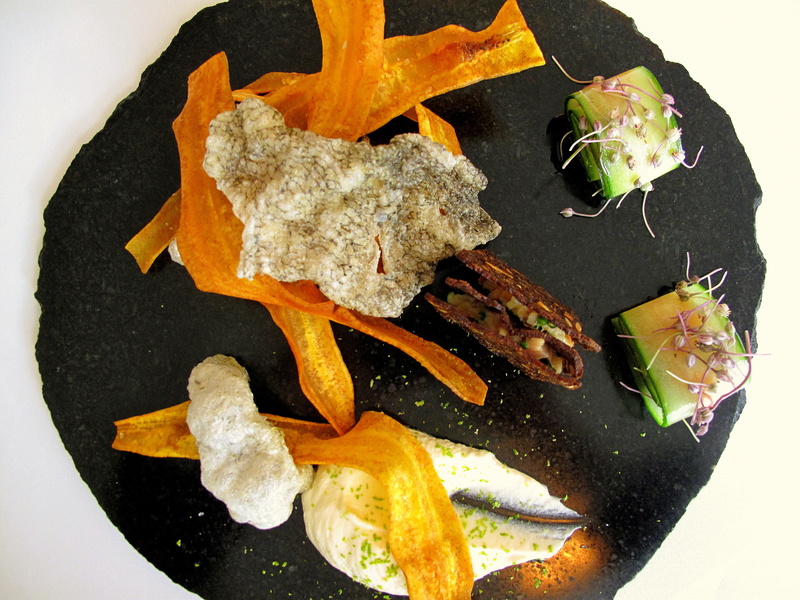 A gruffly hewed ebony granite slab carried skinny strips of delicate local salmon entwined within curls of cool cucumber and sprinkled with fragrant flowers of leek; a small club-sandwich of diced apple and smoked eel betwixt brittle slices of thin rye bread; and chips of thick, fried banana infused with curry and crackly cod skins dusted with pleasantly tart vinegar, all accompanied by a liberal streak of smoked cheese littered with lime zest. 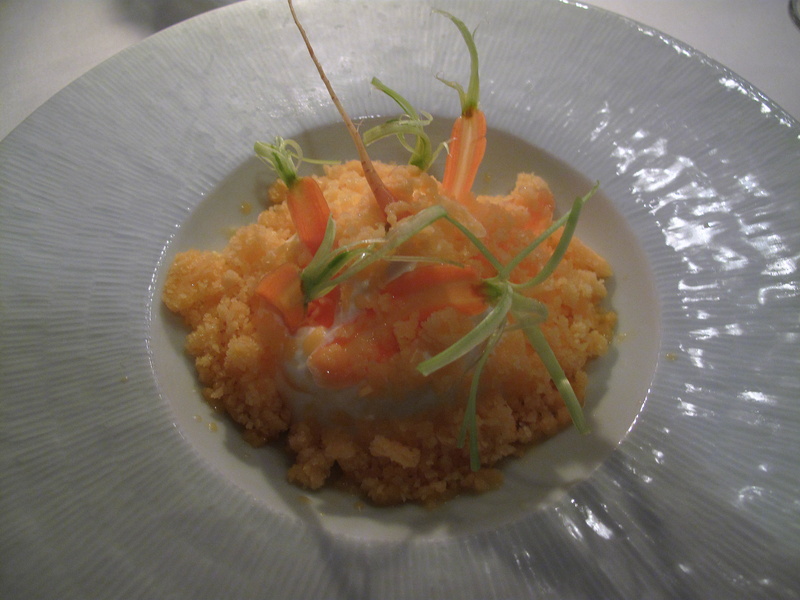 Amuse Bouche 2: Blomkål couscous, varm mayonnaise og dild. A small, straw basket was brought to the table. 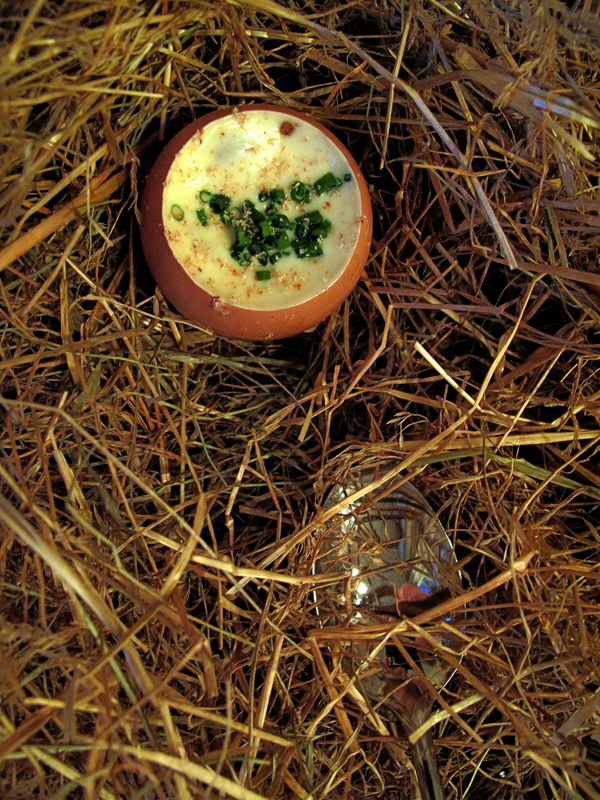 Within, amidst cluttered sprigs of fresh hay, lay a single hen’s egg. Its crown already cropped, inside aromatic nutmeg and dill rested upon temperate mayonnaise, which in turn formed a mantle over a secreted cluster of crumbled cauliflower florets in their own purée. Creamy, silky then crunchy, this comforting and deliciously deep mouthfeel also delivered salty-sweet earthiness, making this something decidedly moreish. Amuse Bouche 3: Østers i sake; grøn peber. 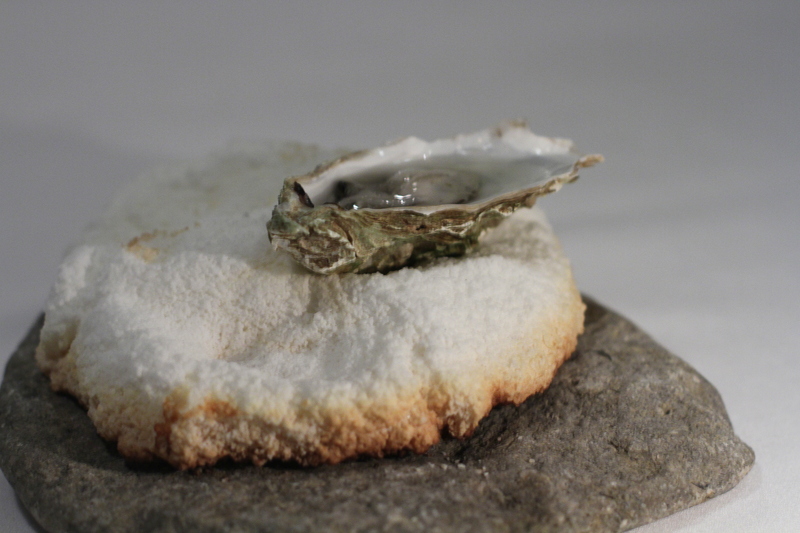 Belon oyster, shucked and swimming in sake along with a lone green peppercorn, sat atop a hot rock. 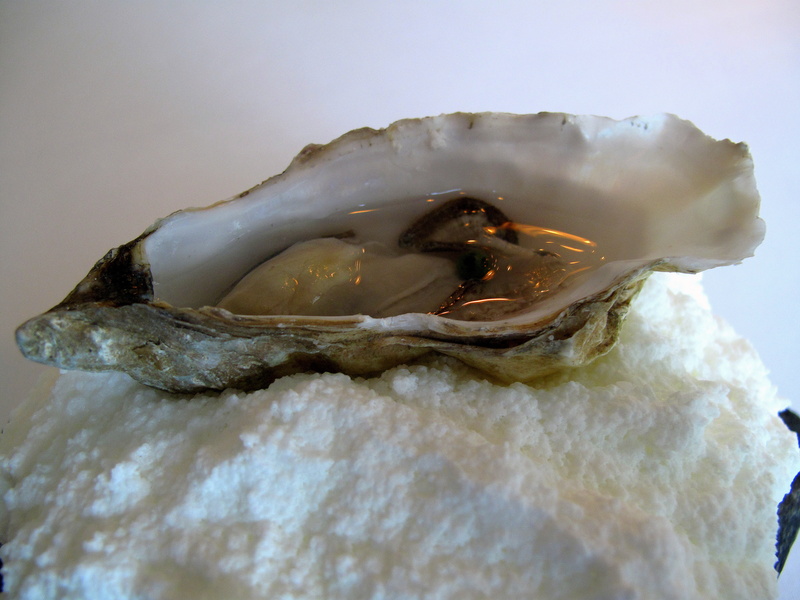 The craggy, bright white chalkstone from Gotland baked the mollusc’s shell, which heated the alcohol and thus the shellfish itself. The consequent shot was strong, spicy and, in my opinion, maybe overpowered the oyster. Brødet: Manitoba, hvedeklid og maltbrød. Homemade breads comprised soft, yeasty wheat bran wedges; dark, crusty malt; and mushroom-shaped rolls of Manitoba that were crunchy outside and fluffy inside. 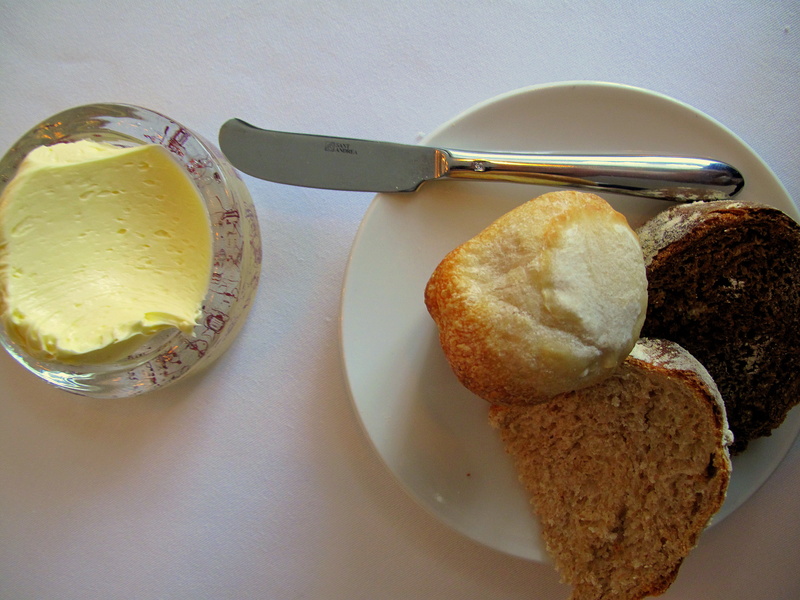 In conjunction, a light and lively blend of organic Danish butter whipped through with crème fraîche and buttermilk in-house was served. Entrée 1: Makrel; Stikkelsbær. 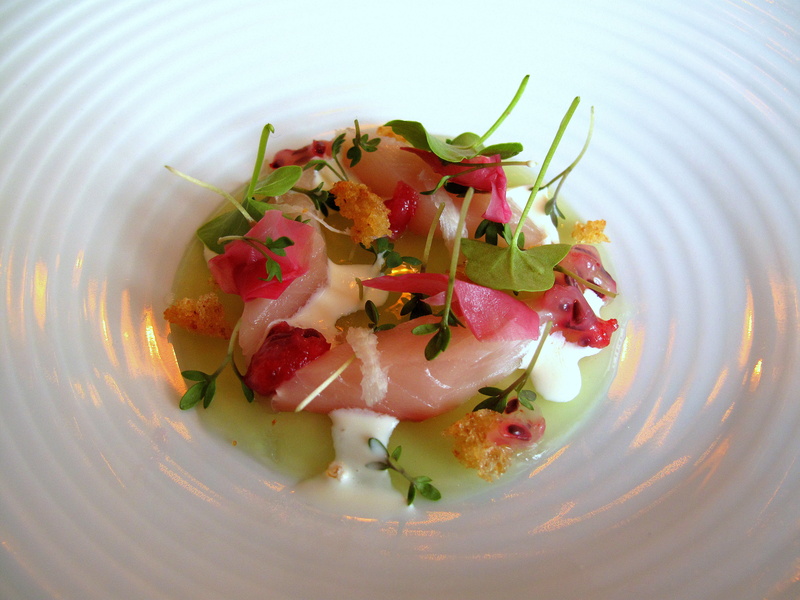 Atop an almost lucent layer of ripe green gooseberry gel, three morsels of raw mackerel were arranged in a small triangle together with precisely placed hibiscus petals, cress, French sorrel, croutons, the meat of mature red gooseberries and dribbles of cold fresh cream. The fish, nicely clean, was mild, but not too meek for the sour and lemony combination of leaves and fruits although the dairy did act as gentle ointment. The grainy bellies of the red berries were also a good foil for the firm mackerel. Entrée 2: Rå jomfruhummere & foie gras; Valnødder & citron. 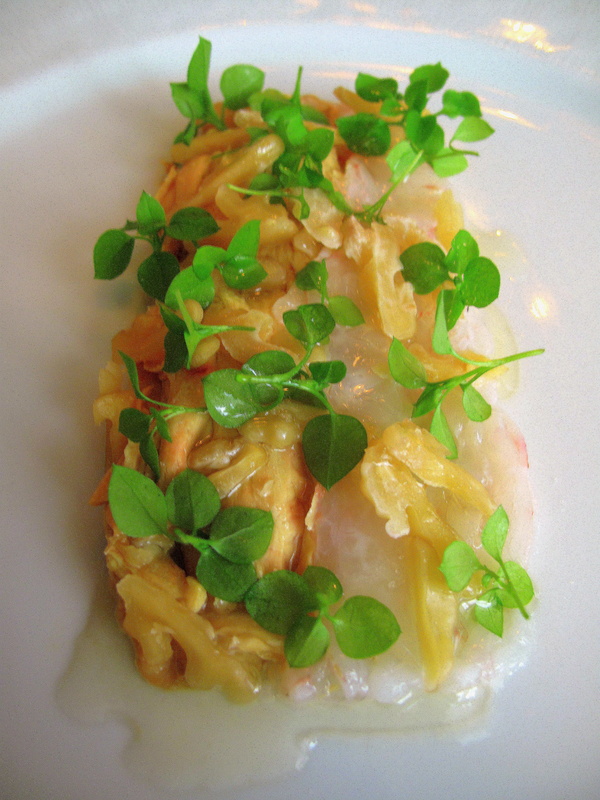 Langoustine tartar and raw foie gras sat side by side in two broad bars. One light, the other dark, they were jointly dressed with chickweed, lemon, fresh walnuts and a drizzle of oil from the same nut. Separate glass saucers offered extra lemon and sea salt. 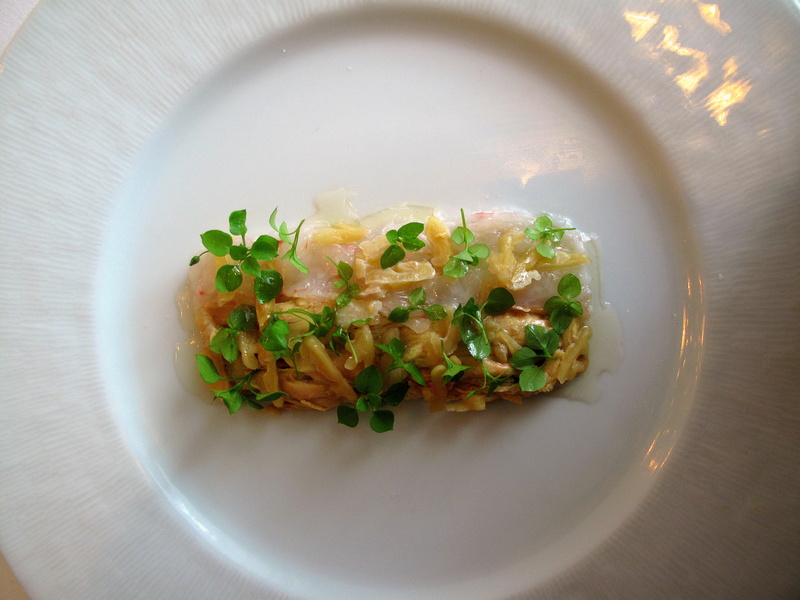 The foie, frozen beforehand, had been grated upon the plate then allowed to thaw so that once at the table it was already velvety smooth and ready to melt in the mouth – the last effect mirrored by its sweet langoustine neighbour. The citron and succulent chickweed helped mete the richness of the former whilst the milk-poached walnut pieces added dull crunch. 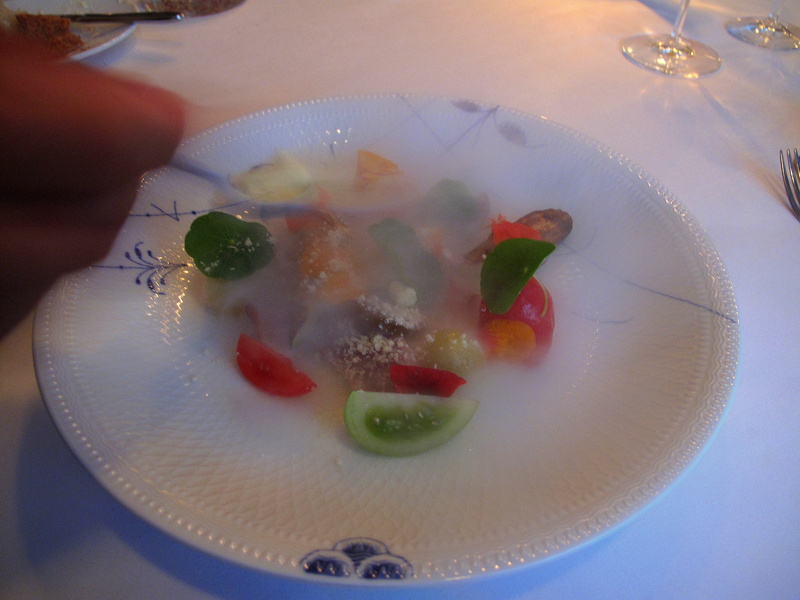 Entrée 3: Pinocchio kartofler; Oste suppe med mandler og kammuslinger. 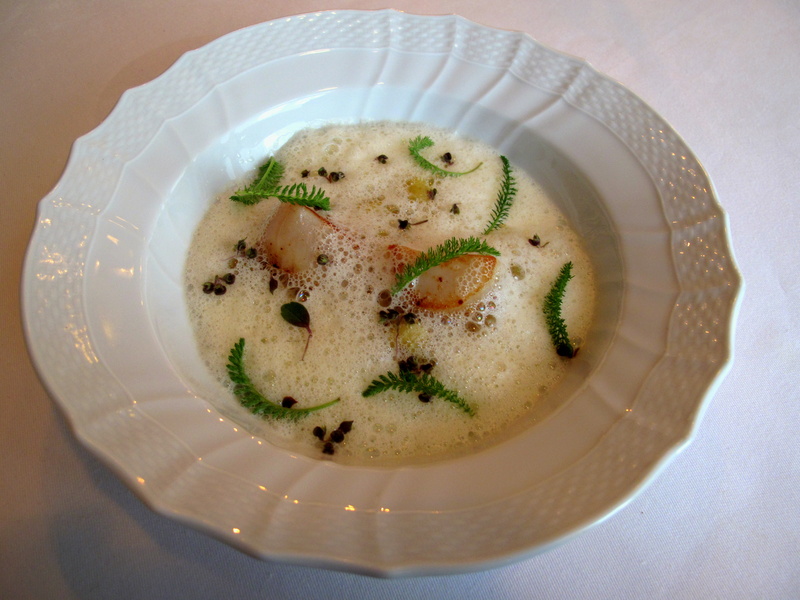 A brace of scallops, seared a soft blonde that almost matched their chiffon-coloured surroundings and basically submerged, were barely visible in a bowl of Vesterhavsost soup. Overtop, unripe basil flowers floated together with yarrow leaves whose laciness loosely mimicked the effervescence of the surface. 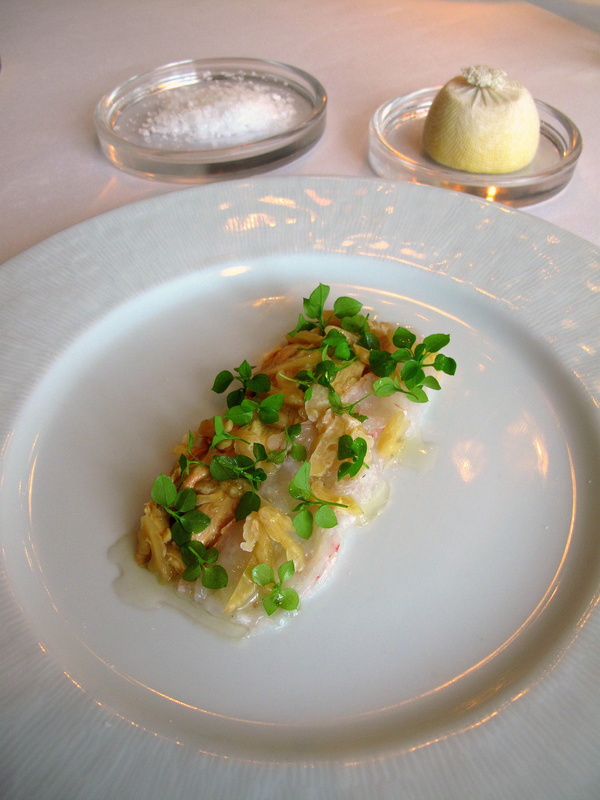 More was buried below this frothy cheesy face – namely delicate almonds and miniature ‘Pinocchio’ potatoes that tendered substance and contrast to the dish. 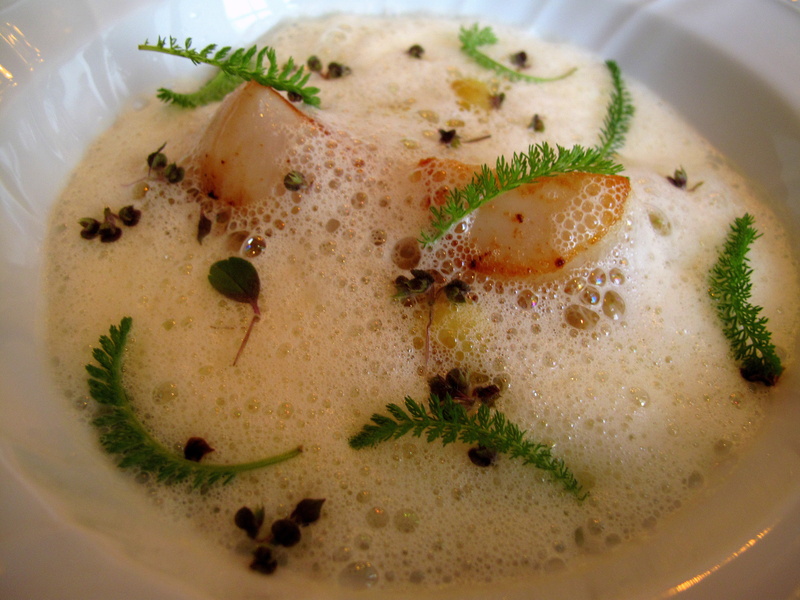 The Vesterhavsost, from the Thise Dairy in Jutland, was salty and satisfying whilst the scallops, sea-sweet. Lemony-mint and bitter hints came from the basil and yarrow respectively. 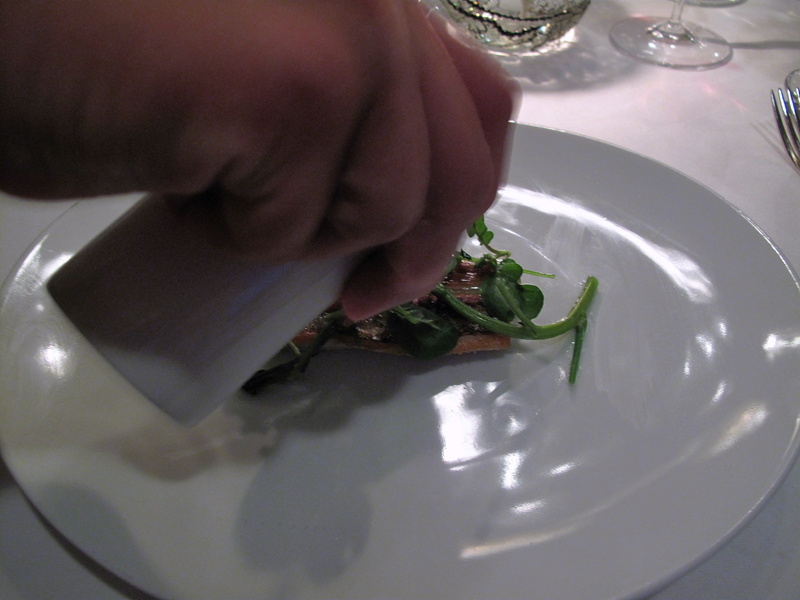 Entrée 4: Asparges pocheret i saltet smør; Luftig vinaigrette af peanut olie. 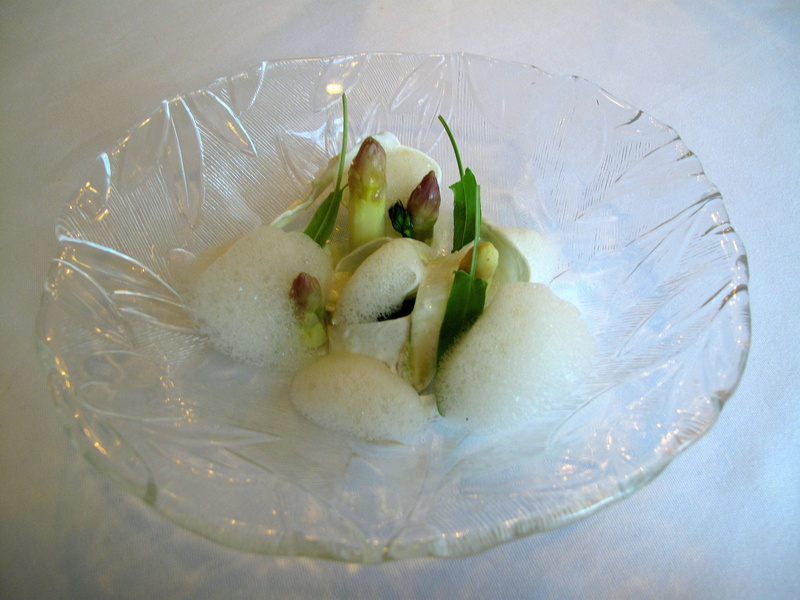 A quartet of green asparagus tops stood upright in the plate’s centre; pickled crudités of white asparagus snaked around these spears while spoonfuls of lime espuma encircled them. 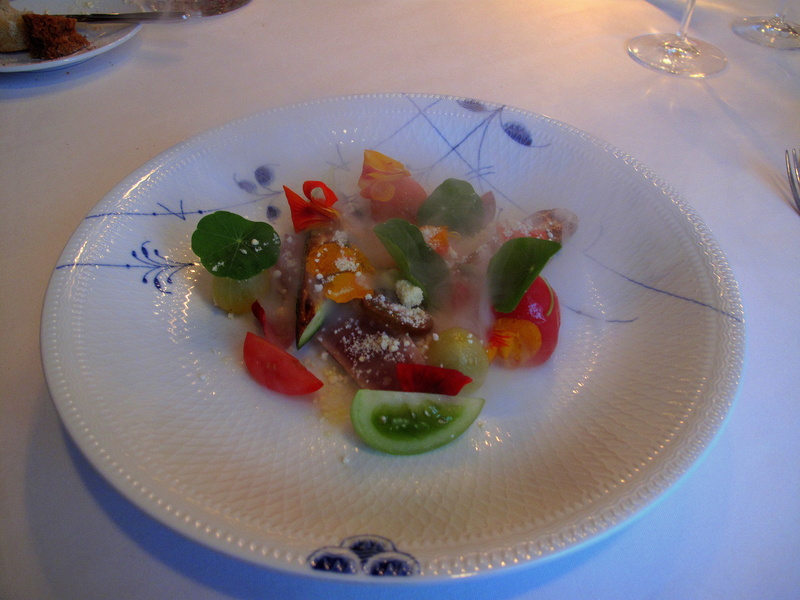 The vegetables – the green poached in salted butter and white marinated in elderflower vinegar – both came courtesy of Søren Wiuff and were both terrific examples. 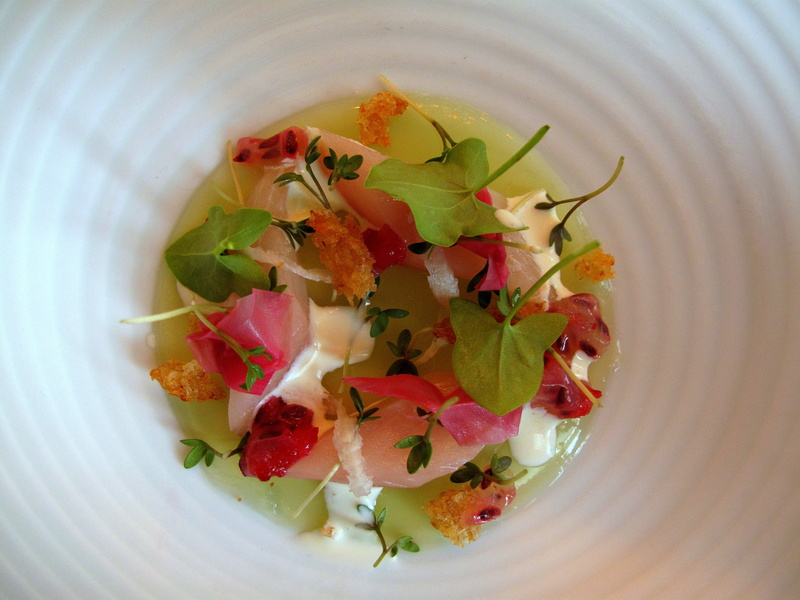 Even if the lime foam and grilled peanut oil vinaigrette were each difficult to detect, the acidity of the baby sorrel and elderflower made a decent attempt to offset the vegetal sweetness. Entrée 5: Tun; Syltede tomater med olivenolie og eddike. Two strips of tuna, just kissed by the frying pan, were plated with multiple preparations of three strains of tomato as well as char-grilled courgettes. 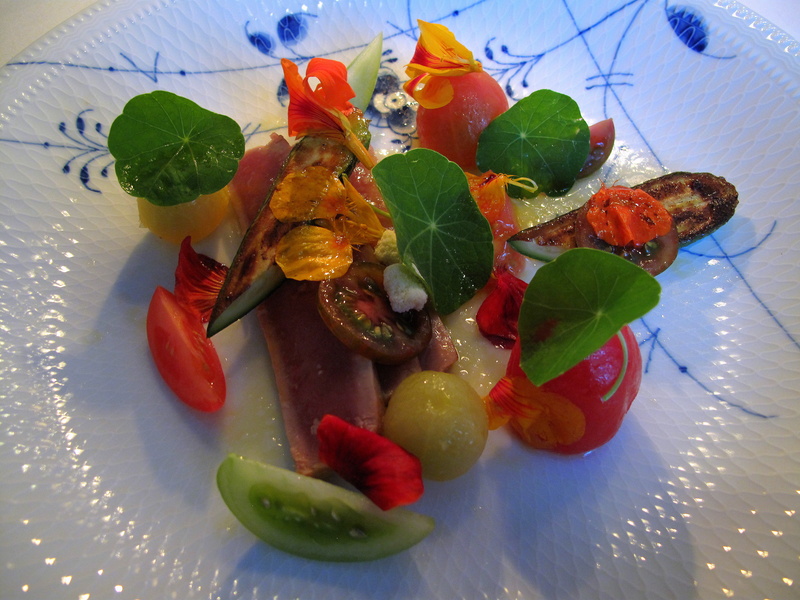 These were all adorned with bright red blossoms and dark green blades of nasturtium; frozen vinaigrette of tomato juice and olive oil was ladled over tableside with dramatic result. There was discernibly deliberate contradiction between this colourful Italian collage and the more sober, Danish Royal Copenhagen china it came in. The tuna, though meaty, was rather mild and hence performed but a minor part overall. Raw and pickled, unripe and mature various varieties of tomato brought differing degrees of tangy-sweet-juiciness with them while naturally linking well with the fruity French olive oil and peppery herbs. Plat Principal 1: Brændende område; Aroma og teksturer af brændende områder. 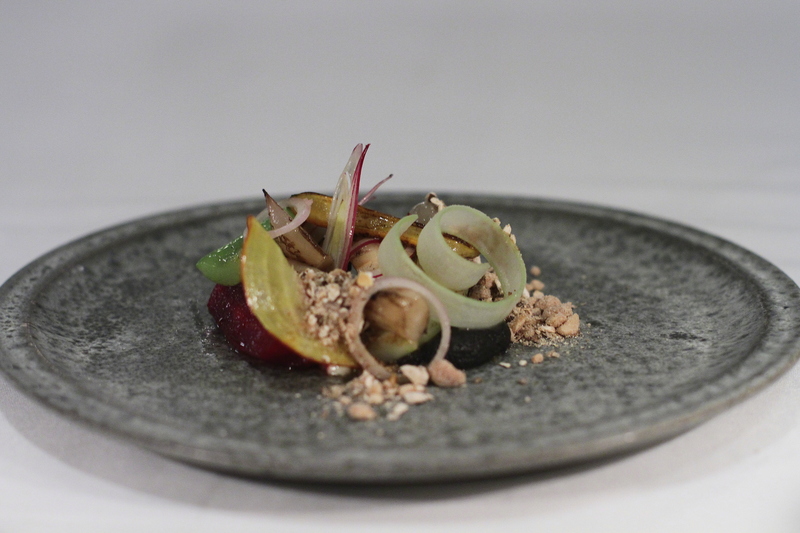 It was whilst at his Samsø summer home, watching the local farmers that once practiced (now-outlawed) prescribed burning as a means of preparing their fields for fresh planting that Refslund was long ago inspired to create this dish. It follows in the long line of vegetable-based signatures begun by Michel Bras and his gargouillou, but rather than simply replicating the Frenchman’s translation of Aubrac’s terroir, the Dane delved much deeper, literally: instead of concentrating on what the countryside shows off, he reveals what it conceals, what lies beneath the soil. A glass bell jar, so densely filled with smoke that its contents had become obscured, was set down. The cloche removed, the cloud disbursed and immersed the table in enticingly smoky aromas of burnt hay before at last exposing the entire plate. Rings of red onion, tender carrots and turnip, parsley root, celery, chips of golden beet and more, marinated beforehand in a mixture of peanut oil, lemon, horseradish and acacia honey and blanched ahead of some quick charring, were served with one immaculate, baby red radish, its sprouts still intact. 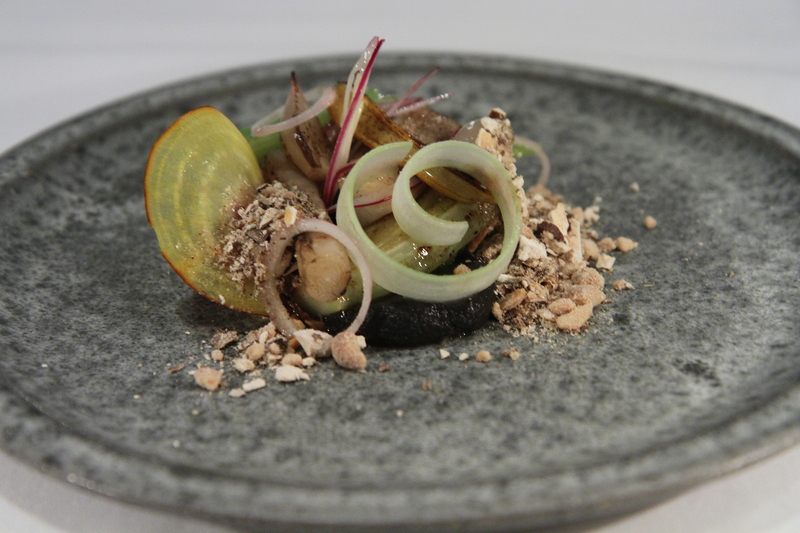 Toasted Jerusalem artichoke mayonnaise mingled amidst these vegetables, which had been assembled over pommes purées; crumble of dried potato skins, roasted peanuts, button mushrooms and muscovado sugar; as well as a dark daub of Gotland truffle crème shaded with sepia. The symbolism was self-evident: the truffle was the soil; the potato-peanut-mushroom powder, ash and embers; whilst the singed roots were the remains after the flames had been snuffed out. Consistent with such a fantasy, these last items had been cooked simply and served in their entirety – scorch marks their only affectation; just as if they had been really found in a fire’s dirty aftermath. Each element achieved an astonishing effect. Although the overall taste adjusts with the season, what stays constant is the strikingly realistic, remarkably authentic acidic-sweet-smokiness. So powerful, so precise, this has the potential to transport the diner somewhere far from the dining room. Plat Principal 2: Hummer; Urter fra stranden og løg. 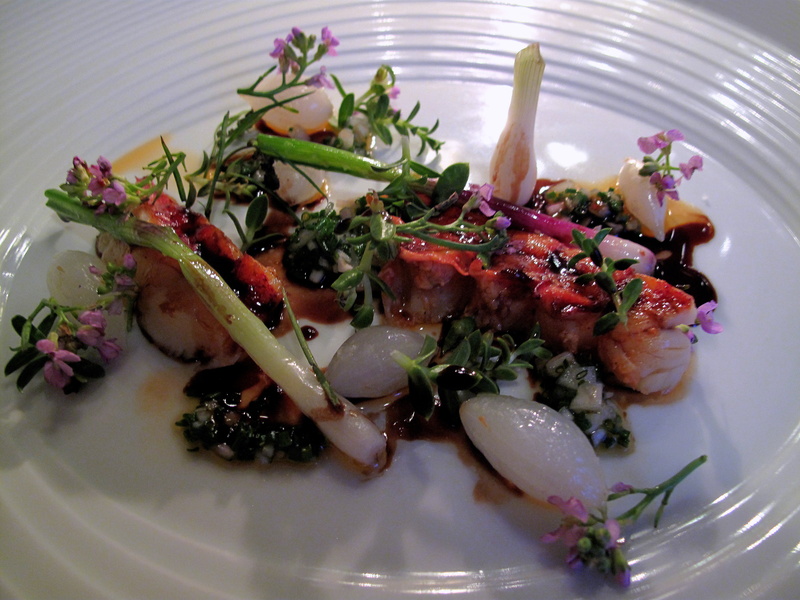 Pearl, spring and young red onions teamed with Danish black lobster, its tail split into two segments and glazed with its own oil, were served strewn with onion-chive vinaigrette, pourpier and beach mustard. The lissom and flavoursome shellfish tallied excellently with the sweetly pungent array of onions, whose succulence tempered the intensity of the lobster oil, which verged on bitter. Poupier were crunchy and saline whilst beach mustard introduced bracing sharpness. Plat Principal 3: Aborre; Vild brøndkarse med porre. 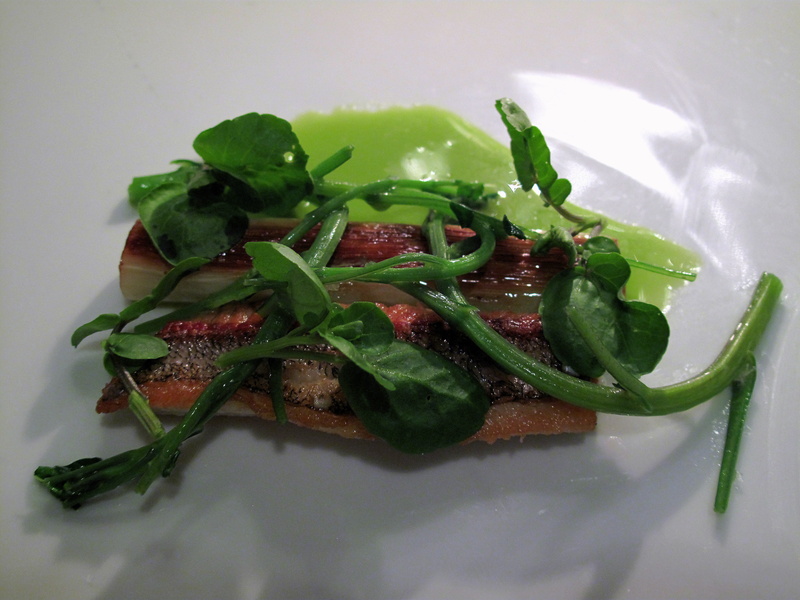 A pair of fair-sided, golden-crested loaves, lined up lengthways and overlaid with curly shoots of watercress, also had the herb’s sauce poured onto one side during its service. At first, the two ingots appeared identical, but on closer inspection, proved not to be so. 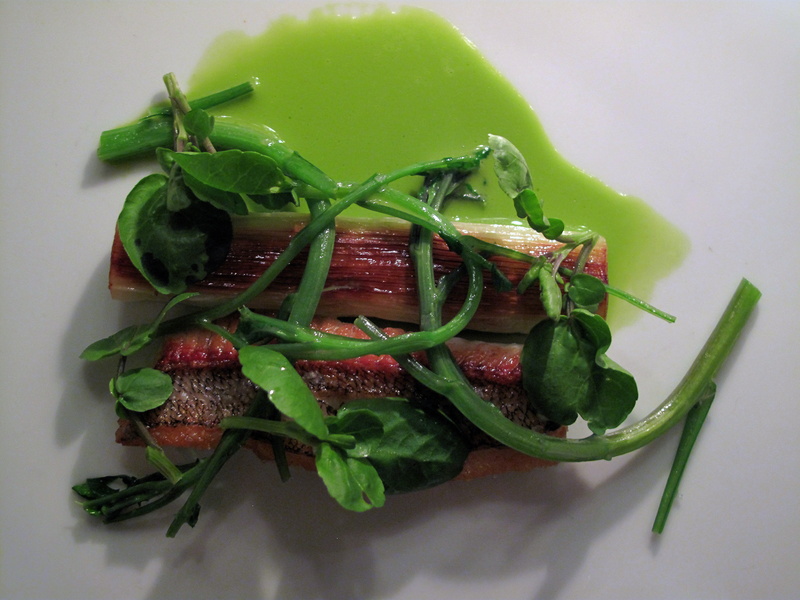 One was in fact pan-fried perch and the other, leek. The former, crisp and salty, and the latter, fibrous and sweet, complemented well the fresh crunch of the stems and toothsome watercress jus. 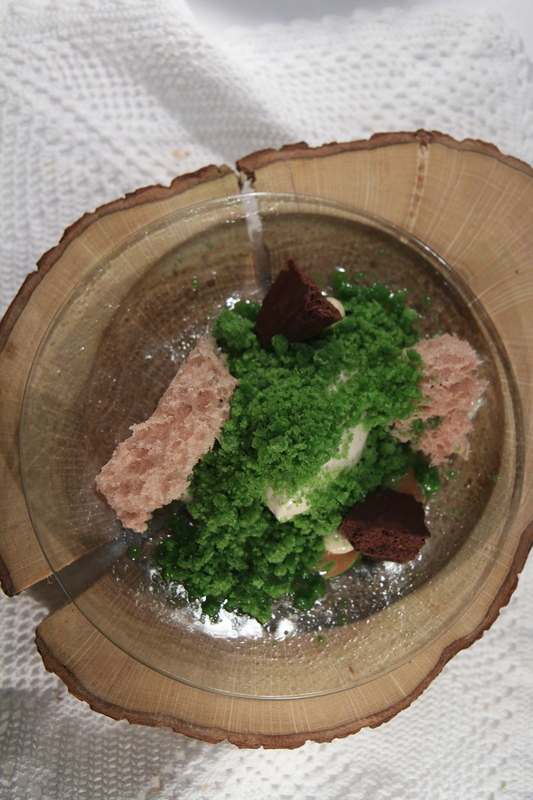 Dessert 1: Gulerødder; Honning og havtorn. Sea buckthorn and honey ice cream, coated in milk and honey mousse, was covered in bright pastel granité of carrot; wafer-like slithers from the vegetables’ centres, leaves even attached, sprung forth from the cool mass. Even though the berry ice cream was quite sour, the roots were equally sweet; the milky medium amid them was pleasingly milder. Dessert 2: Røde bær; Yoghurt og melasse sukker. 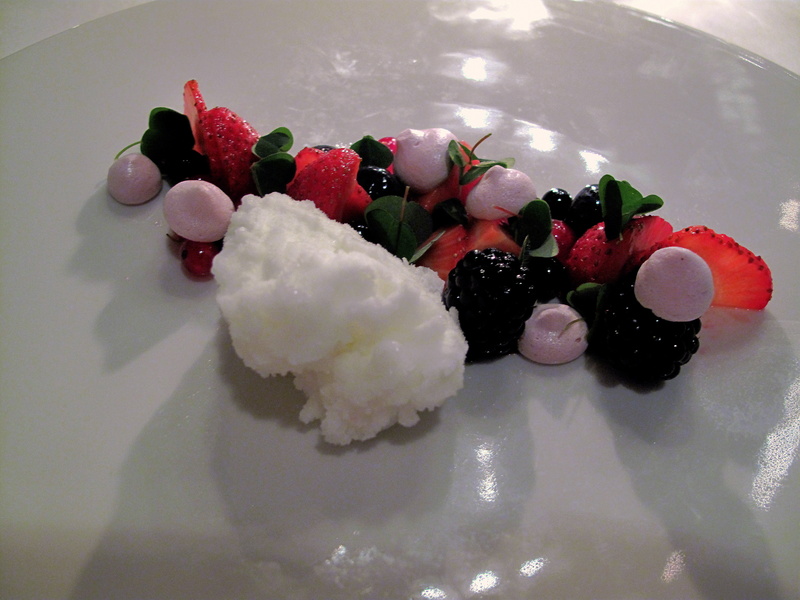 A deftly laid trail of red berries, dotted with tiny meringues and wood sorrel whilst mizzled with molasses sugar syrup, was bordered by a cloud of yoghurt whey sorbet. 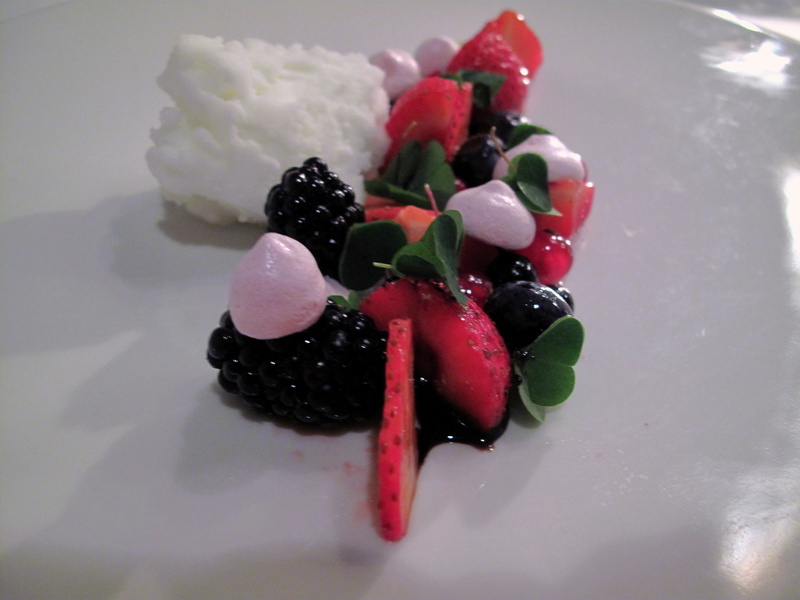 Odd cuts of strawberry and whole blackberries, blueberries, blackcurrants and redcurrants were pleasingly tart and moist. Molasses sugar, concentrated and toffee-like, was met by the delectable sorbet, lemony herb and seasonal fruits. Dessert 3: Skov; Aroma fra skovens træ. 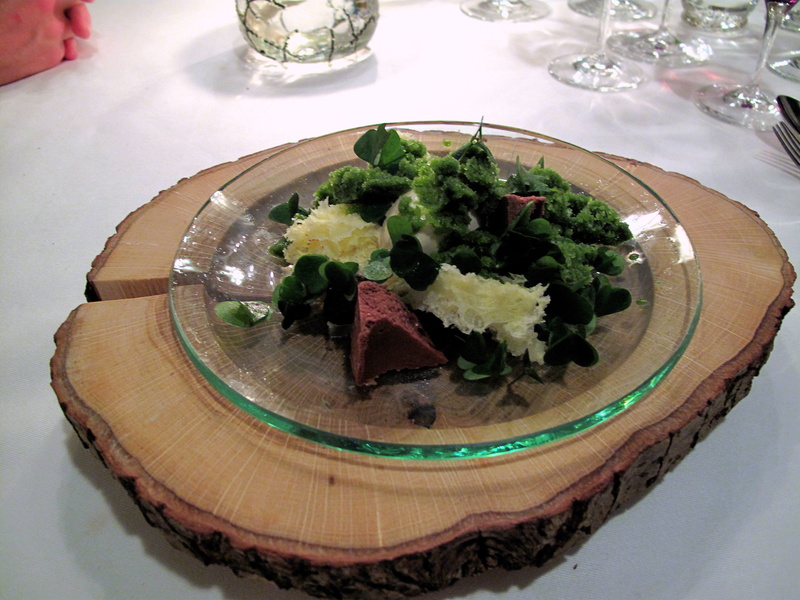 It was only apt that a dessert celebrating the forest to actually arrive upon a solid oak cross-section. 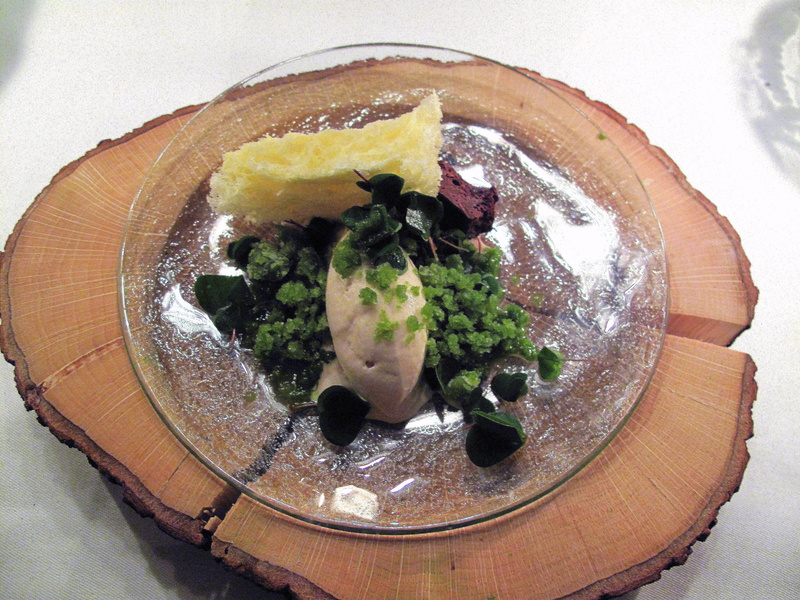 Sponge-like chestnut cake and a scoop of birch ice cream, straddled with pine granita, dominated its display. Underneath these, oak caramel, toasted hazelnuts and pine chocolate were also present over homemade nutella that had been painted over the plate. Together, these components formed a natural accord that was refreshing and interesting. There was dull sweetness from the birch, more from the chestnut, an uplifting sense of pine and subtly woody oak in addition to a small measure of fulfilling chocolate. Nonetheless, a minor criticism may be that this chocolate, chilled by everything else, eventually became too cold to dissolve away on one’s tongue. Petit Fours: Kaffe trøffel med mandler; og peanut trøffel med mælkechokolade. 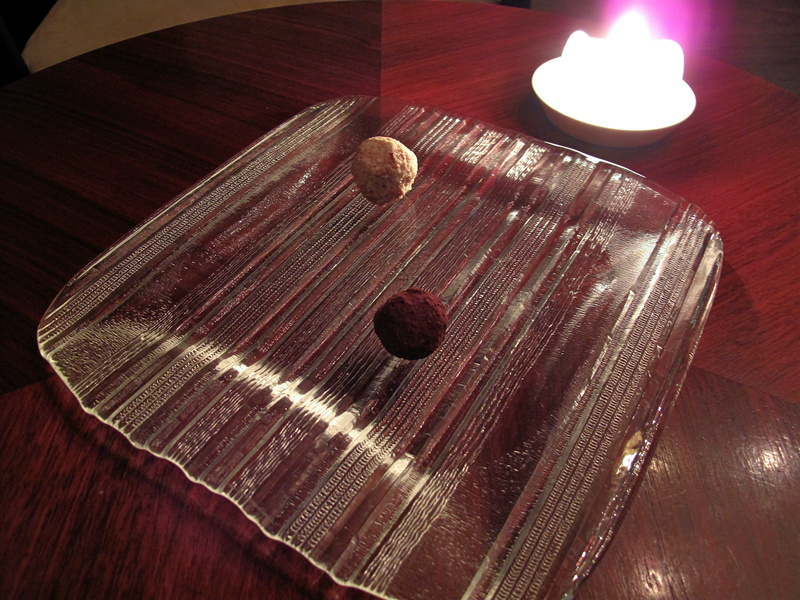 Two chocolate truffles meant the meal’s end. A smaller peanut and milk choc was buttery, nutty and smooth whilst a larger one of coffee and almond had roasted savour and delicate bite. Service was relaxed yet still retained some formal structure. There was a restaurant manager and sommelier who tended to the clients on a continuing basis, but – in Nordic fashion – dishes were carried out from the kitchen and, as required, plated at the table by the chefs themselves. This team, consisting principally of Mads, Jesper and Asbjørn, were each extremely well-natured, friendly and generous company. The building certainly had charm and character while the ambience was a tranquil and serene one, which suited the rather handsome and understated setting. Furthermore, there was a keen and captivating juxtaposition between these surroundings and what was served. Refslund’s more modern recipes as well as his sense for efficacious tableside theatre and appealing presentation often made for an interesting comparison with this aged milieu, which perhaps actually added a certain consciousness and/or deeper gravitas to the experience. One especially conspicuous externality of this dim and calm dining room was evinced when the kitchen door slid open: for a few brief moments, there was a sudden, curious din from within and a burst of bright light whence the chefs, swathed in white, enter. It was an eloquent image. The earliest amuses bouche were, on the whole, very good. They were also meaningful. Besides such local staples as salmon, smoked eel and cheese, fish skins and rye comfortably sat curry, sake, banana and lime. 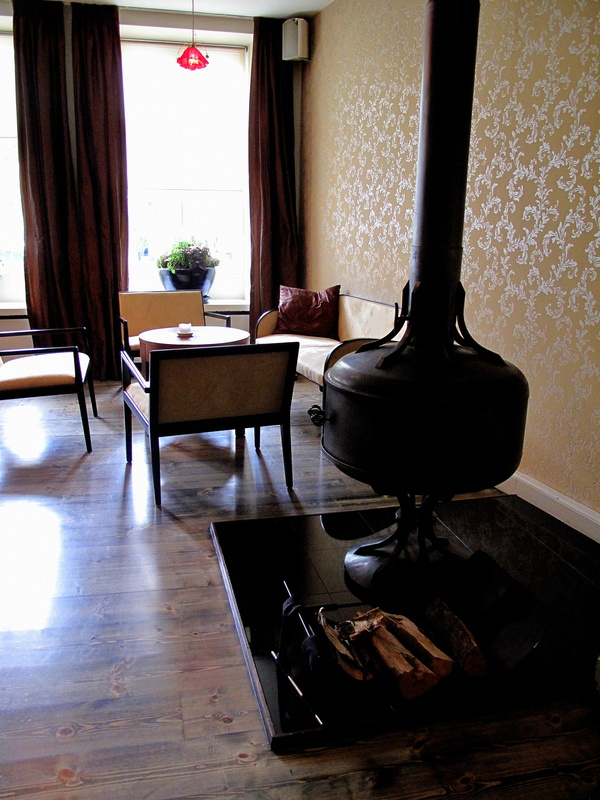 Although all things Danish had their place – pride of place – here, MR was clearly not a closed kitchen. 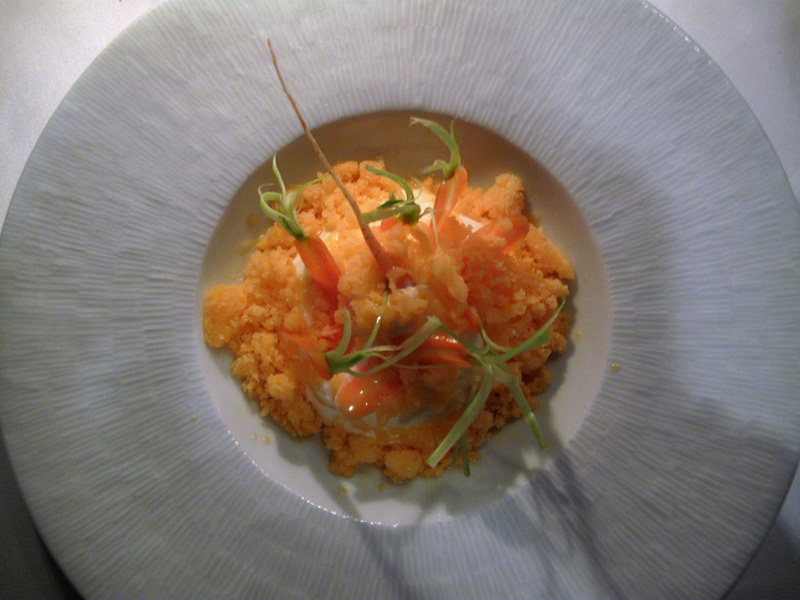 Then, suggestive of a gift with its winsome and dainty delivery, the cauliflower couscous egg was luscious and lasting. Conversely the østers i sake that followed was the only item of the day that I did not like. Rå jomfruhummere & foie gras is a Mads Refslund classic. It was easy to discern why. To begin with, the plate was simply very easy on the eye: dark and light, tanned and white, the two principle parts carpeted over with golden walnut and brilliant green. Then, of course, there was the taste. Just a few herbs plus a squeeze of lemon were necessary to attain an instinctive and absolute balance between meat and marine. 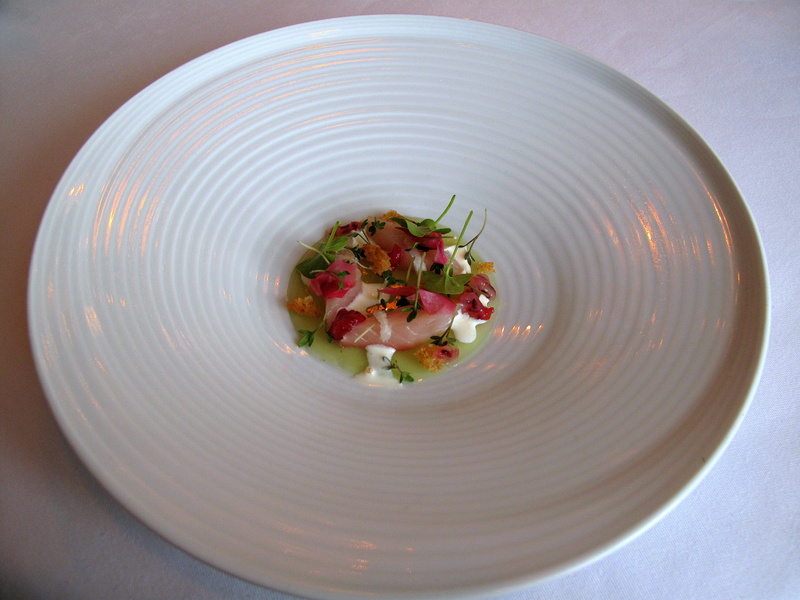 The chef’s fondness for clean flavours and lightness appeared, at least on paper, contradicted by the next course – pinocchio kartofler; oste suppe, effectively cheese and potato soup. In his hands, however, this heavy-sounding recipe was really something surprisingly modest and graceful yet full of savoury relish. Afterwards, in spite of being one of the weaker servings, asparagus in salty butter still bore incredible ingredients – specifically those of Søren Wiuff from Lammefjord. Actually, for what it is worth, this farmer’s asparagus are the finest I have ever had. When asked to articulate his approach, Refslund has responded, ‘I don’t know if it’s typical Danish, but I use a lot of Danish things, almost all Danish things, Scandinavian things. But…I just wanted to throw in some Mediterranean accents and…I love olive oil from Italy.’ The tun illustrated that. On the pridie of August, he would not let geography for geography’s sake intervene with this seasonal selection of choice tomatoes, courgettes and olive oil. And then. Brændende område; Aroma og teksturer af brændende områder. Burning field; Aroma and textures of burning fields. It is a title far too practical for a thing so poetic; too literal for something as romantic; far too efficient for anything this expressive – it is an economical name to express a moment of whimsy. This is in fact one of the best dishes I have eaten anywhere. 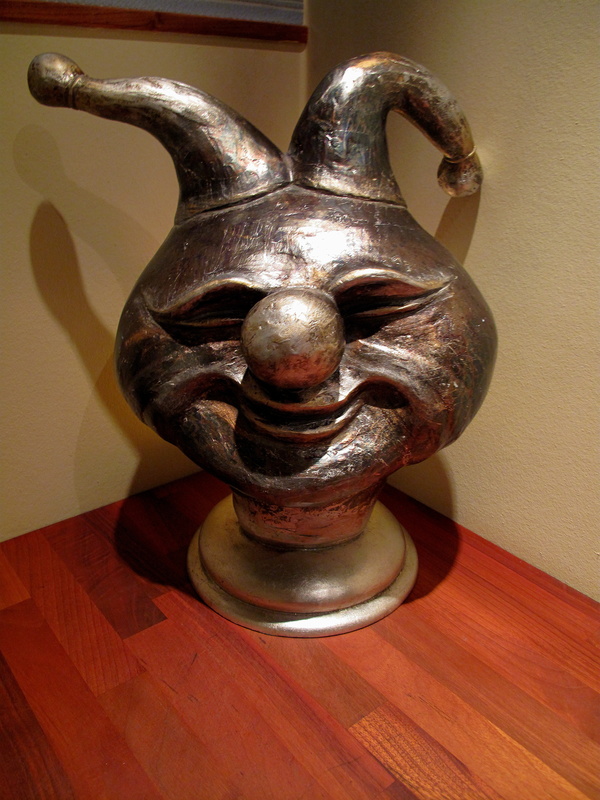 Presentation, performance, suspense, savour, illusion even and then some more stem from this. As the aroma captivates, the tastes tingle and tease the tongue and lips whilst the astringent, dusty, pasty textures smother and gently dry them out. A stunningly successful and convincing course this was. 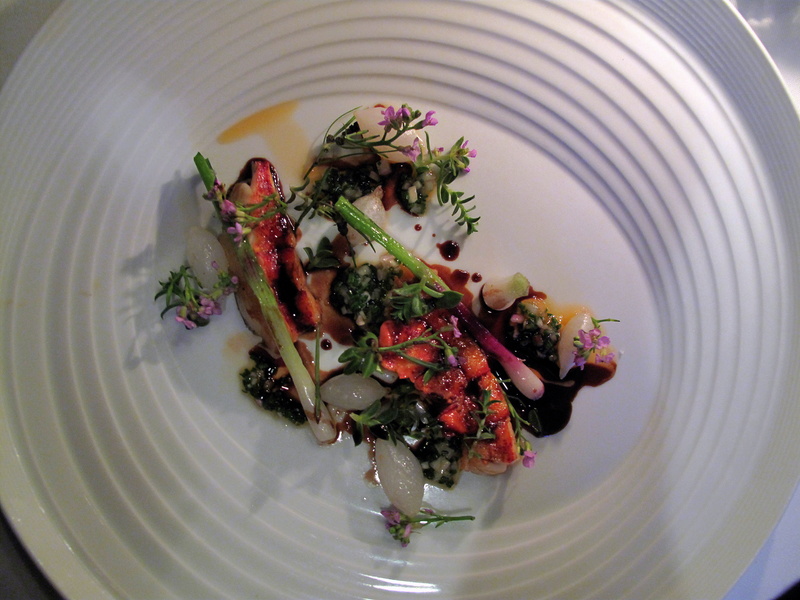 Dinner continued with the excellent lobster; beach herbs and onions. This was an accomplished example of marrying mer avec terre – or hav med land; of bringing out subtle and balancing strong flavours. Next, the aborre; vild brøndkarse med porre was capable, but – considering its place as the final savoury – did not surpass what went before it. On the other hand however, one can argue that after the high arrived at with the burning fields, the fairly robust lobster and then cleaner, lean and lighter perch offered an easier landing and softer shift into desserts. 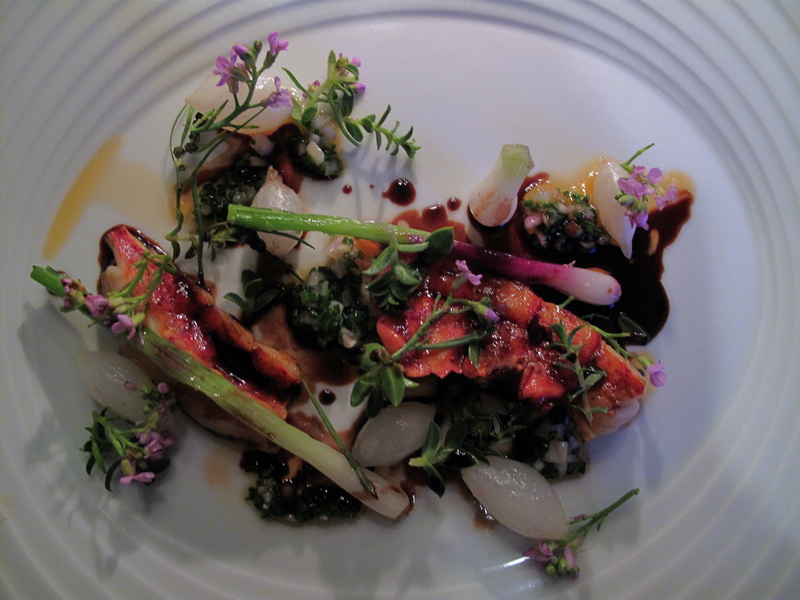 Plus, the chef’s visual ruse with the fish and leek was rather cute. 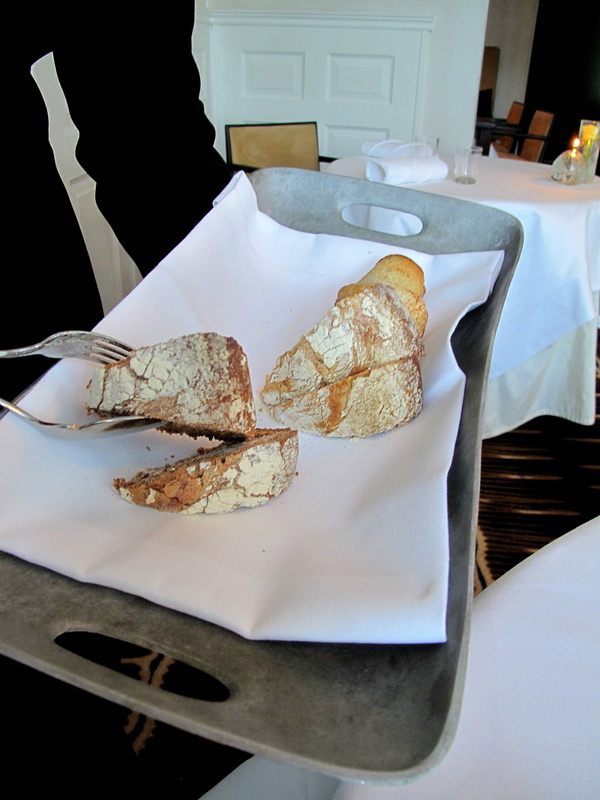 In the main, savouries were more memorable than desserts. Forest fruits (skovbær), such as those in the røde bær; yoghurt og melasse sucker, are in Denmark customarily boiled down into a compote called rødgrød and teamed with cream (fløde). 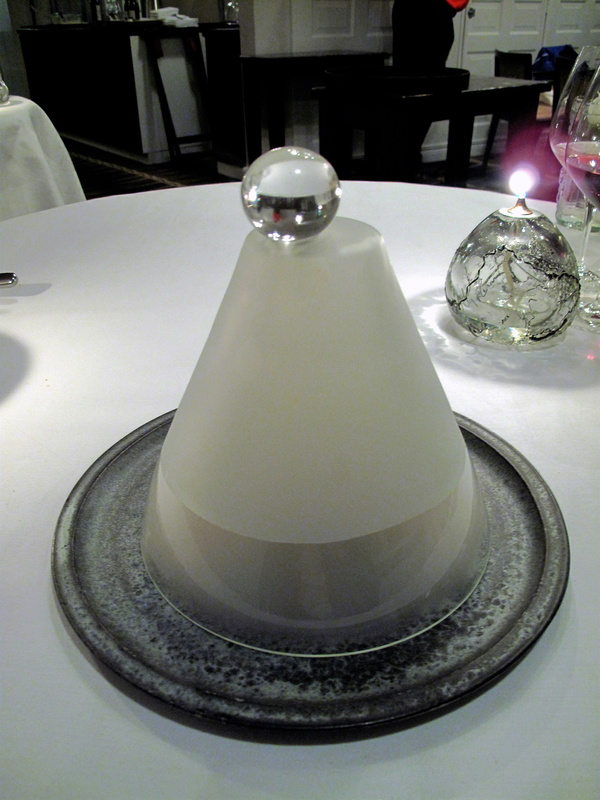 Refslund’s reworking comprised the same fruits served whole with yoghurt sorbet. Lastly, skov; aroma fra skovens træ demonstrated one final time the chef’s panache for plating and flair for finding stimulus outdoors. ‘Bonding rawness’ is how Refslund explains his philosophy. This concept entails a closer assessment of produce, extending to its quality and freshness, but essentially going beyond that. Raw materials are ‘visualised and chosen for their intrinsic values’; the aim is the ‘highest expression that nature produces’. The consequence is a cuisine ‘seeking to sustain ingredients’ natural and original flavours and ‘not to pollute [their] pure taste with excessive preparation or cooking’. A sensible consideration of Refslund’s style maybe ought to begin with his concentration on the ‘three pillars: fish, shellfish and vegetables’. In this regard, the restaurant’s reopening was a reincarnation – and perhaps a renaissance. 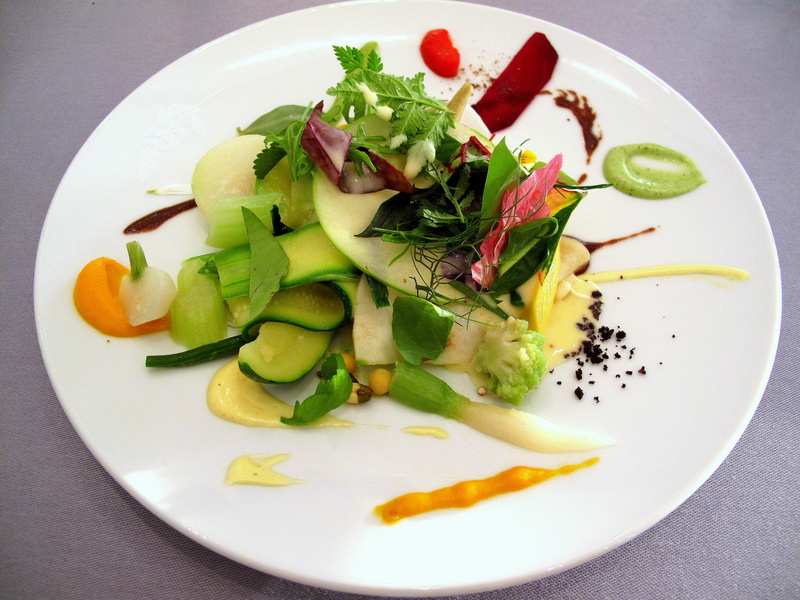 For the chef, the transition was commonsense – ‘the last two years I have been very eager to work with fish and vegetables and the closure [was] a good chance to change things completely.’ He even ‘considered [working] exclusively with vegetables, but I was afraid’. He goes further to justify his decision: ‘quality and freshness are deep in our DNA; in Denmark, it’s our privilege that marine animals grow more slowly in a cool climate, which gives them time to develop more savour – the same applies to vegetables, longer in the soil. Since we’re largely surrounded by sea and fields, everything we need is within reach; we…can therefore also keep CO2 emissions to a minimum.’ Given my own proclivities, this new approach is one I can sympathise with. Refslund’s creations are emphatic on arrival. He has a canny sense for presentation and production, equally able and effective with the subtle and cerebral – recall the mental contradictions with the tuna – as well as with the dramatic and explicit – remember the hay-smoke-seeping cylinders served at the table. Nature is the chef’s first inspiration and one of his strongest talents is his ability to realise in the kitchen and on the dish ideas derived from his environment – ‘the sea, forest, field and so on’. 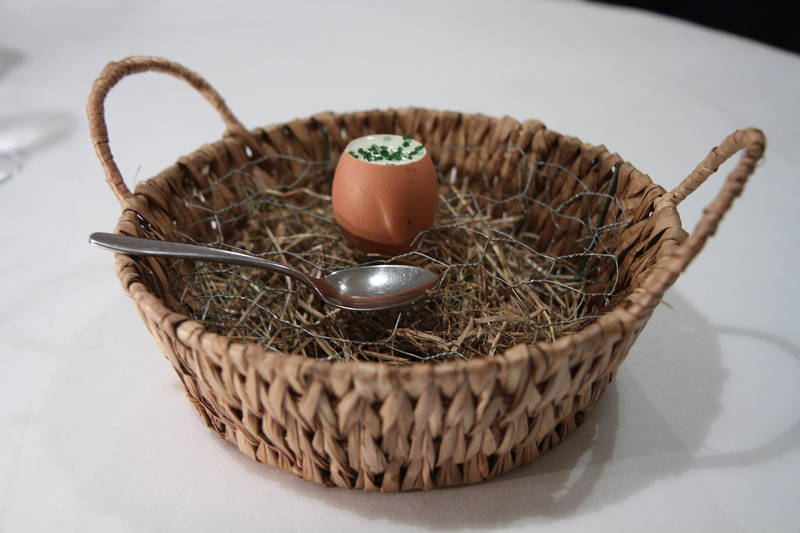 The egg sitting in straw as if freshly laid, oyster seemingly washed up upon a stone and forest-flavoured sweet things sitting atop a slice of oak were all just some example of this today. 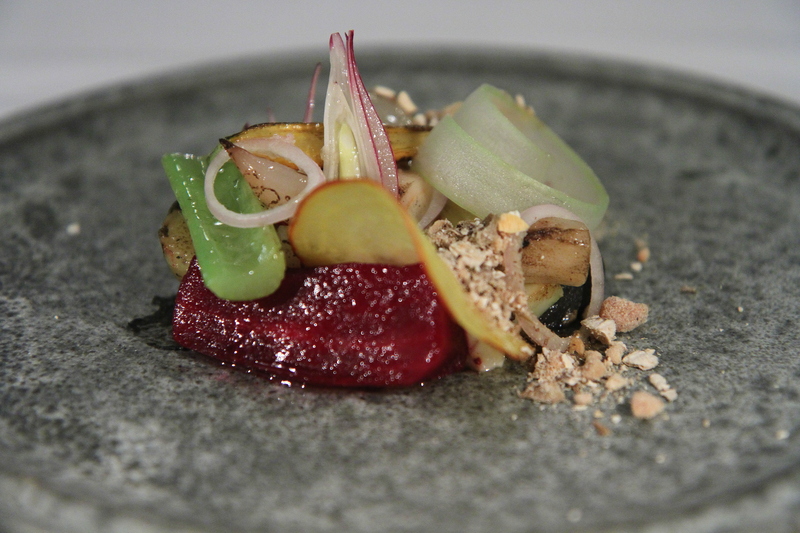 Refslund certainly has a reputation for innovation – Redzepi describes his friend’s restaurant as ‘like el Bulli meets the north’. It is an invention rooted in tradition: ‘I like to experiment with old recipes, handed down from my grandmother. The ingredients are distinctive and you recognise the taste immediately. This is pure nostalgia. And we love that’ – as demonstrated today by the red berry dessert. He also draws heavily on Nordic culture, which ‘gives me moments of profound insight that I strive to capture and transcribe,’ citing here his fascination with smoke. 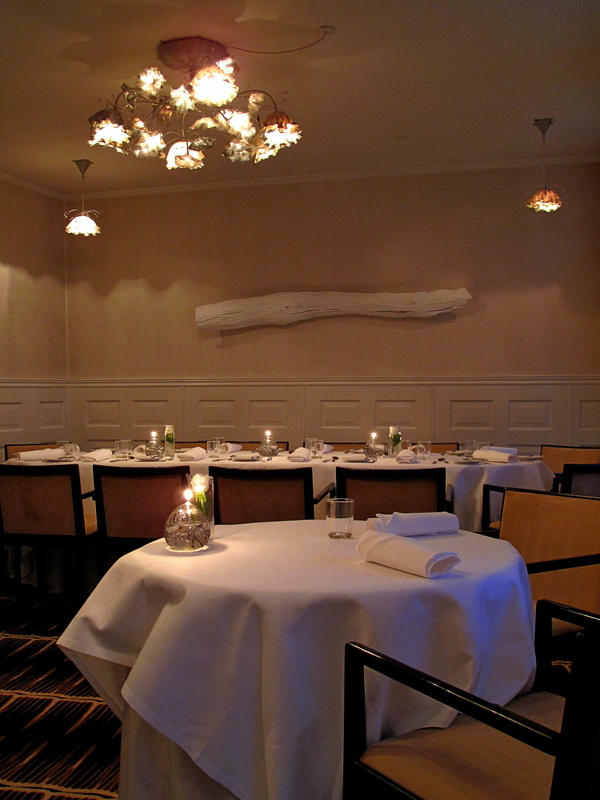 As an interestingly aside, in a number of ways, Mads Refslund rather reminds one of another – Pierre Gagnaire. Any similarity is not so much with respect to their food itself, but relates to their manners, methods and mentalities. Both are capricious characters, who work well on impulse and whim. Both are modern chefs who like not to restrict the worlds within which they work with geography or ideology. And both of their spontaneous styles are deeply personal ones. The benefits of this can be immense – meals can be revelations riddled with moments of magic – but there are inherent risks too. Chiefly, their absence, although not necessarily detrimental, might at least mean a different experience for the diner. In MR’s case however, sous chef Jesper’s ability and dependability have been proven already as it was in fact he, not Refslund, who cooked tonight. 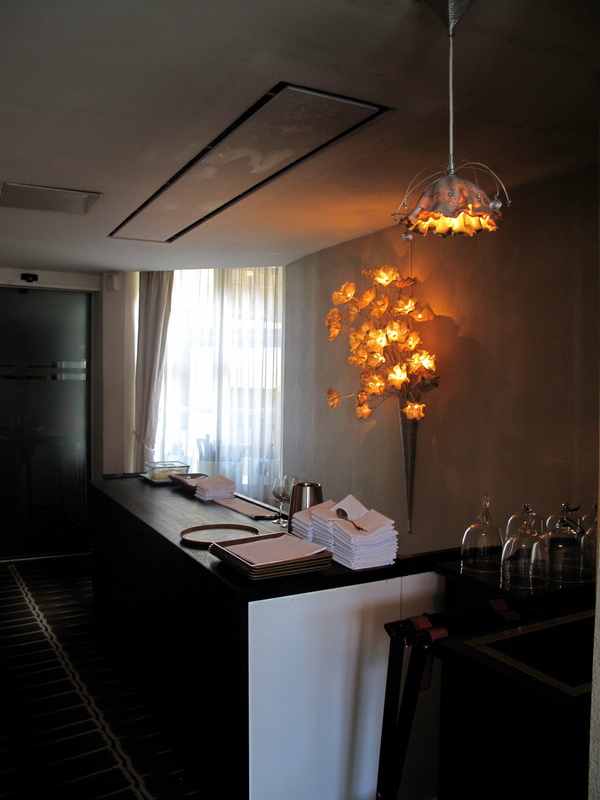 The two have also been criticised for the lack of consistency and flow within their menus. In my experience, even if there were dishes this dinner that were only decent (personal taste will always play a part, I suppose), constancy in terms of quality and execution was definitely not a concern. Indeed, it might be fair to say that this meal seemed more a succession of great plates rather than a deliberate progression to some point – I am not sure whether I even know if I prefer one attitude over the other. But what I do know is that of both Refslund and Gagnaire, I am a fan. Seemingly sealed off from the rest of the city, Refslund has sought to create a reflection of himself at MR: ‘I have put my mark in every nook and cranny.’ No one takes themselves too seriously here and there is an irresistible spirit that translates into a dynamic, engaging, entertaining yet intimate experience: it is simply so much fun. Ironically enough, ‘I am actually afraid of deep water,’ confesses Copenhagen’s foremost seafood chef. 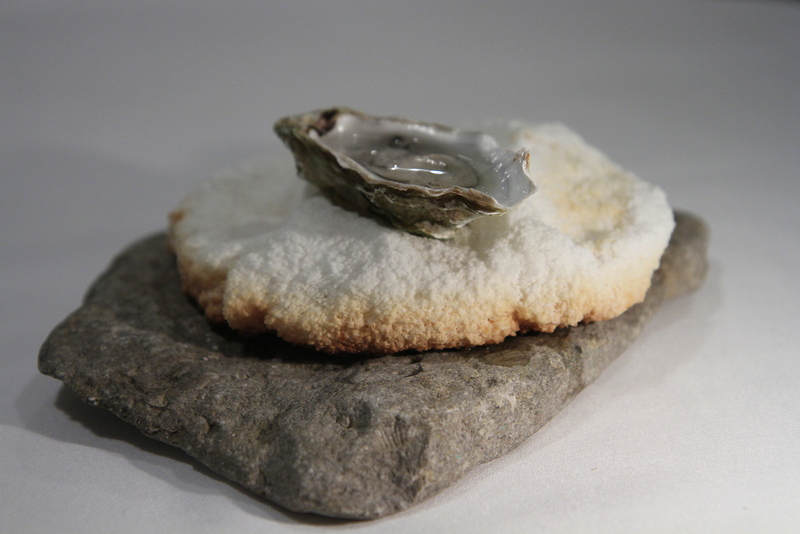 ‘I probably have too much imagination; if I can not see the seabed… I can only swim because my mother forced me to learn.’ It is an illuminating remark seeing as creativity and fancy are abundant at this ‘hothouse for the art of cookery’ as the chef calls MR – where a cuisine founded upon natural, Nordic fundamentals is exercised instinctively with grace and good-humour by someone who appreciates aesthetic and theatre, has comfort and confidence in his own cooking and owns an intuitive understanding about ingredients. Moreover, some measure of talent and even more potential does Mads possess. Mads, the mercurial. Loved it before, and looking forward to loving it again when we return for a visit this summer. Lovely review, really enjoyed reading it. In addition to Gagnaire, there also appear to be faint echoes of Passard, no? 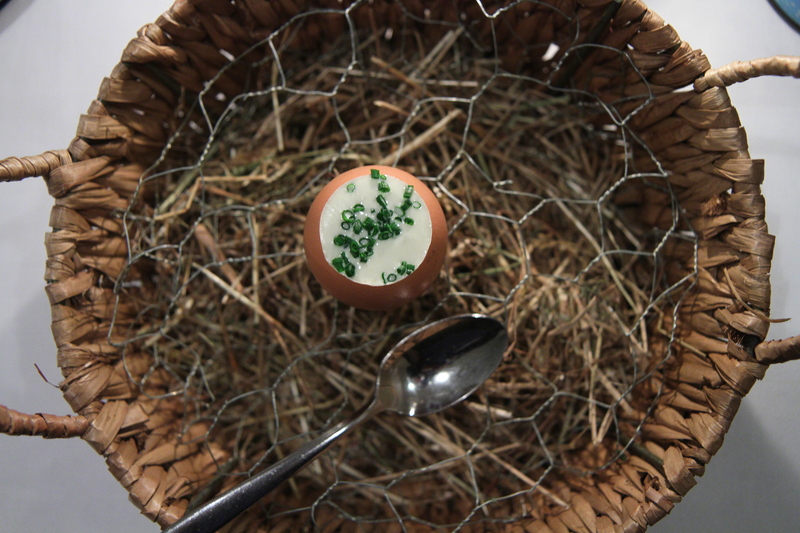 … Dramatically shifting away from meek, the elaborate serving of a single egg, etc. Really nice photos too. 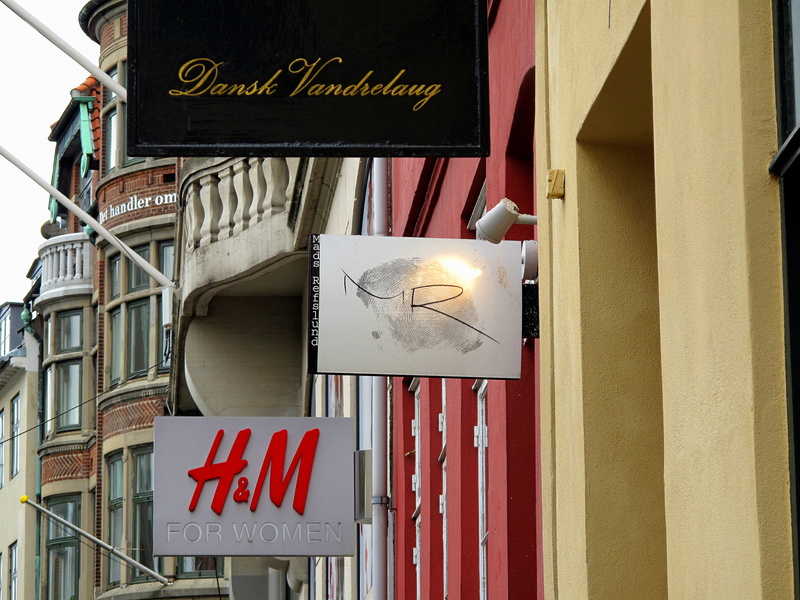 This is definitely a place I will (try to) visit in Copenhagen the next time I’m there…along with Noma, of course! 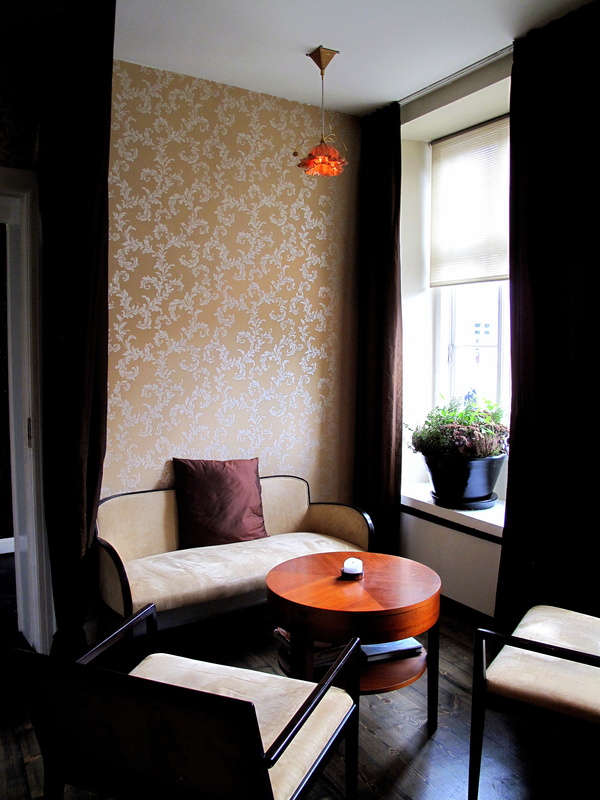 Been thinking about heading over to Copenhagen in the Fall and checking out your reviews there. Are the 4 restaurants the best of where you went, or is it all of them? Just trying to get a good number of options going. thanks! If you wish, send me an email with what you are after and I can respond better. These four are just a selection. 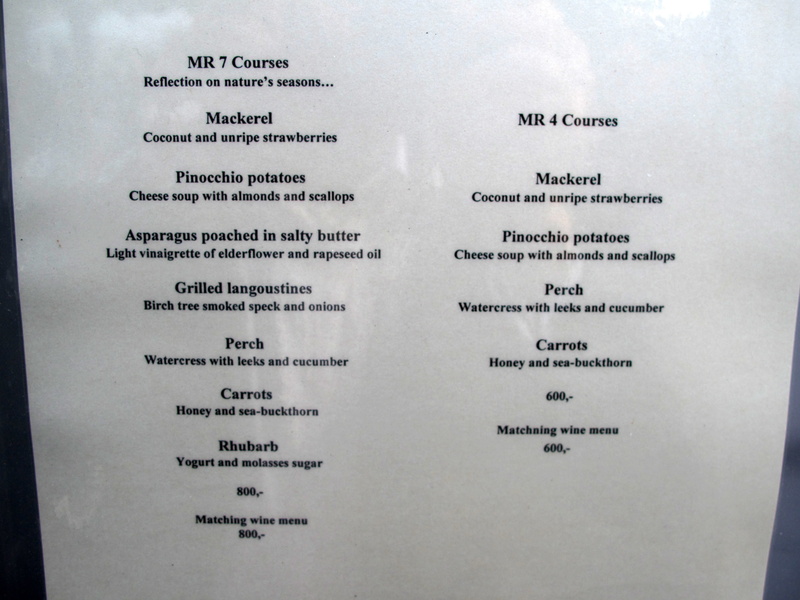 Had one of the most memorable meals ever at MR – and I eat out a lot ! really good, outstanding !